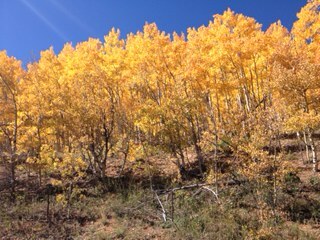 Two years ago as the season turned from summer to fall, I was driving through Colorado and northern New Mexico, and saw the stunning harbingers of the season in the forests of aspens. Last year as the summer became fall I was on the west coast of Florida to see my children, the beauty of a completely different order, serenity of a different hue and promise. These summer and fall seasons I have felt sidelined from the turning of the season because of surgery and recovery. I watch as the children go back to school through my front window. I follow the many adventures of my friends and colleagues as they take their sojourns to exciting or exotic locations. I notice that committees and kick-off events are happening without me. Since here in Southern California there are not critical changes in the weather, I look up our current predictions for the day, all usually well within the temperate zone, which tell me that Fall has come. But my focus is here where I am, with the resources that I have this moment, looking over the place where I have been planted. It is a lovely place, a place of stability that I have been given to savor and to share, even as the world turns. It has many moments of deep stillness, a capacity to invite and enjoy host of beloved ones or just one. I have a window to the street and another window to the sunrise. Many birds visit, along with our dog, the squirrels and the occasional unwelcome possum. I live in God’s world, as well as God’s season, God’s time, God’s rhythm. I have been reminded again in this season of relative confinement that it is all Grace, and that the only appropriate response to Grace is gratitude–for bringing me safe this far–in Love, in Beauty, in Joy. So let the season turn–in me, around me! And so Pentecost comes! Traditionally the liturgical colors are red with yellow, reflecting the fire that alighted on the heads of the faithful in Act’s story of that event, signifying the illumination and power of the Holy Spirit. But Maren Tirabassi, contemporary liturgist and prophet, has called our attention to the fact that in some circumstances, this year, for instance, flame and wind are not positive and encouraging symbols; in the case of the horrendous fire in Alberta, Canada, and in other places around our planet, fire is only a force for destruction and devastation. So she in her winsome and provocative blog, Gifts In Open Hands, has lifted up other metaphors for the Holy Spirit. Her musings immediately pointed me to that earlier medieval liturgist and prophet, Hildegard of Bingen. I am the breeze that nurtures all things green…I am the rain coming from the dew that causes the grass to laugh with joy of life…I am the yearning for the good. I am looking at new plantings of a more drought resistant grass in the small patch of lawn in my back yard. They are bright green as they take root, and they need much less water than our previous sward. They remind me of places where I would invite the Spirit to bring her nurture into greenness–my energy for coming alongside others, my patience for sitting still and listening as the Holy One speaks, my perseverance in doing those things that will bring good for others, now and in the future, my openness to hearing, seeing and sensing what is new. I would love my life of prayer to become jade green, shining and gem-like in its consistency and beauty. I would like to wander down forest green paths of Mystery that I have not yet discovered. I pray that my encounters with those I meet be bright kelly green, sparking with mutual compassion and appreciation. The colors of all life will be brightened with a fresh infusion of the greening of the Spirit. Now the green blade rises from the buried grain, wheat that in the dark earth many days has lain; love lives again, that with the dead has been: love is come again like wheat arising green. Come, Holy Spirit, green my heart! As I continue to follow the recommendations of the reflections of Joyce Rupp, I am practicing another the emphases of Celtic spirituality this week–discovering the goodness of Creation. She suggests “listening to creation,” pausing to look at what you see, finding something new to you, and letting creation reveal its deeper meaning. This is much more challenging to me than last week’s call to see God’s presence in the ordinary, in my case blessing each of my children morning and night. I seem, either by nature or nurture, to need to work at connecting with creation. I have been working hard at trying to engage what Calvin calls the “second book of revelation,” the natural world, and so this invitation to a focused practice is welcome, though not easy. 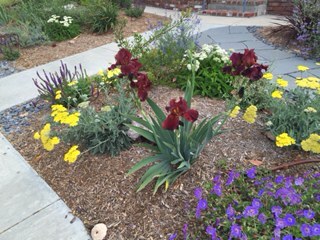 However, I have received a gift that has made the practice more central in this past year which is the installation and blossoming of a drought-resistant garden in our front yard. We chose to embark upon this project for practical reasons: the merciless drought in Southern California has frightened and threatened us all. We have been given standards by which we need to decrease our water usage, and have been seeking ways to be good stewards of the water we do have. The garden took longer to install and cost more than we first estimated, despite the rebate that came from the state government. Yet what has developed where our lawn used to be is a constantly unfolding display of wonder and beauty. Under the tutelage of the marvelous Merilee, a garden designer, we were able to create and execute a garden that not only saves water for our parched land, but gives us examples of the ways that God’s mercies are new every morning, much to our surprise. It begins in the dark. It is full of surprise. I am never sure when I go to bed at night what I will find in the morning that has blossomed. During Advent our purple bearded iris on the south patch kept us entranced with a new bloom almost every day, a continual parade of glory from one violet sentinel to the next. Now in Lent the white iris on the north side sheltered by the salvia has begun the same array, one blossom per day; is it marching us toward Easter? The variety seems infinite. Just when I think I have noticed each plant and flower, another one emerges in shape and color utterly different than the one next to it. What are those little neon green capsules all in a row? What are those tall drapy red leaves in a bush? What color are those tiny florets hiding behind that prominent plant? Creation, when I focus my attention, has more manifestations of beauty and design than I can count. I continue to be challenged by beauty. I have long known that I am “buoyed by beauty,” a phrase that I read in a narrative describing my beloved isle and community of Iona in Scotland. But my own little clusters of drought-resistant plants in front of my house keeps expanding my definition of what beauty is–not only vivid color, now only shapely fronds, not only striking succulents–but odd outcroppings, angular leaves and open patches are beautiful too. And how glad it makes me. This week I am taking care to observe–truly, madly, deeply–the creative array that proliferates in my front yard, and ask myself how this reveals the Holy One to me. Calvin teaches me that there is much about the Mystery that can become known in creation. I am hoping that is discovering the goodness that is there, I will also have a deeper intimation of the goodness of God. Personal photo from front garden. I am learning slowly slowly, slowly, to let the created world teach me about its revelation of the Holy. Somehow my early experiences and teaching left me without the sensibilities that could easily sense God in Creation. I certainly appreciated glorious sunrises and sunsets, loved any place I could get close to the ocean, and delighted in the parade of dogs that marched through our growing family. However, I don’t seem to have the natural affinity for Nature that comes to others easily that is a part of our faith journey–the understanding of the Holy in the natural world, which Calvin calls the second book of revelation, after the written sacred texts. Two events have coincided this past year to pique my attention and to ground my intention to seek the Holy in becoming a deeper lover of the beauty of this Earth God made, and to be a more faithful steward of its resources. First, partly in response to California’s desperate drought, we have replaced our front lawn with a drought resistant garden last summer. I am sure we had no idea of the complexities of what we were doing, but with the help of a landscape designer and our long time gardener, my husband brought together an array of native plants and flowers that have become a garden of earth grown delights. Each morning as I go out the door, I am reminded that God’s mercies are new every morning. And I am often surprised: irises bloom, bees hum, the lavender bush is full of tiny birds–wrens maybe? With my soul primed to learn and practice more stewarding of the earth, I have read the compelling books of Beldon Lane, retired professor and Presbyterian minister, in which he lays out both the this theology and his practice of experiencing the Presence of the Holy in nature. In reading a compilation of the essays of Catholic theologian Elizabeth Johnson, I was further enlightened and inspired by her clarity on her premise that a person of faith mus embrace caring for Creation, particularly in its present crisis. Then, a colleague referred me to Pope Francis’ new encyclical, Laudate Si’, as a gripping and important perspective of the Church in the 21st Century in relationship to the Earth, a document I am eager to read. My intellectual awareness has become replete with ideas and premises that are beginning to re-shape the lens with which I view the natural world. So as I went away with my family to a campground last weekend, I chose as my spiritual practice to attend as closely as I was able to what was there in the natural world, to watch it closely, and to trust that the Holy One could speak to me through what I was experiencing. In a canyon that led to the beach in the California sunshine, I saw all kinds of birds–bullying scrub jays, swooping ravens, supersonic hummingbirds; and as evening fell, the was a huge bevy of quail walking across the road, then ascending to the sky as a noise disturbed them. I sat in stillness under a bright half moon, and listened to the quiet. And I also noticed the bright red poison oak, and heard about the distressed sycamore trees, suffering from lack of water. One writer from my reading had posited that each particular created thing brings glory to God by being exactly what it is, nothing more, nothing less. And that was the Word for me, among the variegated array of God’s ingenuity–I am to be myself–nothing more, nothing less– and by so doing, I am bringing glory to God. I can rest, beloved and grateful, in the Presence of the One who made us all bright and beautiful!